This review first appeared in the January 2017 issue of high-end hifi magazine fairaudio.de of Germany. You can also read this Lindemann review in its original German version. We publish its English translation in a mutual syndication arrangement with the publishers. As is customary for our own reviews, the writer's signature at review's end shows an e-mail address should you have questions or wish to send feedback. All images contained in this review are the property of fairaudio or Lindemann - Ed. Books 'n' beats. In early November, my fairaudio colleagues asked. Was I game to review Lindemann's new musicbook:25 DSD? I paused. Two years ago I'd written up the predecessor sans DSD. What could possibly have happened in the interim to warrant a new feature review? Well, a quickie chat with their Christopher von Delhaes bumped up my curiosity. Apparently this was a complete overhaul. Think full top-to-bottom renovation. Chris' emailed white paper still added more juice. Darn it. I capitulated and haven't regretted it since. Let's start with everything this newcomer can do. The DSD suffix in the nomenclature gave it away: this musicbook:25 is DSD ready (the original can be updated). The 'old' version redlined at 24/192 in pure PCM. The new one goes up to quad DSD (256) and does 24/384 PCM. What's more, either format is available natively via its own discrete path. But because Lindemann believe that PCM-->DSD conversion is musically salubrious, one can also exploit on-board format resampling on the fly via the ultra-precise internal clock which is said to minimize jitter degradation by more than 40dB. Pas mal as the French would say. Not bad. Hence, Lindemann ship their deck with the default setting of 44.1/48kHz-->DSD128 whilst all PCM above that upgrades to DSD256. Obviously the menu offers access to change that back to native PCM with or without upsampling. Also new is the aptX Bluetooth receiver compatible with AAC. Unchanged is unbridled socketry enthusiasm via two analog line-level inputs, six digital variants (USB-B for Mac/PC on the back, USB for storage in the front, 2 each coax and Toslink), RJ45 LAN and a WLAN receiver. Analog outputs are on XLR and RCA. Both are live simultaneously so can be used together. That's useful for multi-amping, subwoofing, active speakers and such. The streaming module is upgraded, too. It now supports external streaming clients (Tidal is already integrated, others to follow). Even networked DSD is available though does rely on DSD-ready server software like Twonky 8.2. Completely new is the D/A converter section by using the latest AK4490 chips from Japan's Asahi Kasei aka AKM in dual-differential mode. These critters enable resampling of a quality that's promised to revitalize stale Redbook fare. Far from least, Lindemann extended their comprehensive stem cell rejuvenation to the preamp stage which now runs a premium-class Muses 72320 attenuator chip [also championed by Pass Labs amongst others – Ed]. The headphone amp is discrete and powers cans upward of 32Ω in class A/B mode. 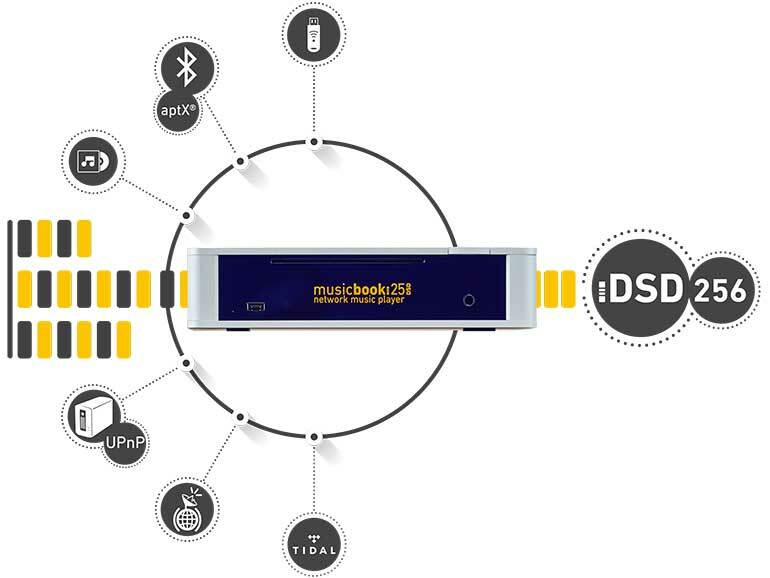 As before, the musicbook:25 can be steered in three different ways: via its rotary encoder that can be turned or pressed to access the most-used functions like volume and input selection. Then there's the wonderfully tactile beautifully styled remote control; and most elegant of all, the proprietary app I already covered for the precursor. The only change there is the inclusion of streaming services which are handled just as poster child perfect as everything else always was.